The officers’ conviction on all 25 counts – on two counts, the jury found the men guilty but with partial disagreements on the nature of the crime which could slightly affect sentencing – comes nearly six years after the city was devastated by floodwaters and government inaction. The verdict helps rewrite the history of what happened in the chaotic days after the levees broke. And the story of how these convictions happened is important for anyone around the U.S. seeking to combat law enforcement violence. The results of this trial also have national implications for those seeking federal support in challenges to police abuses in other cities. New Orleans is one of four major cities in which the Department of Justice has stepped in to look at police departments. Any success here has far reaching implications for federal investigations in Denver, Seattle, Newark and other cities. 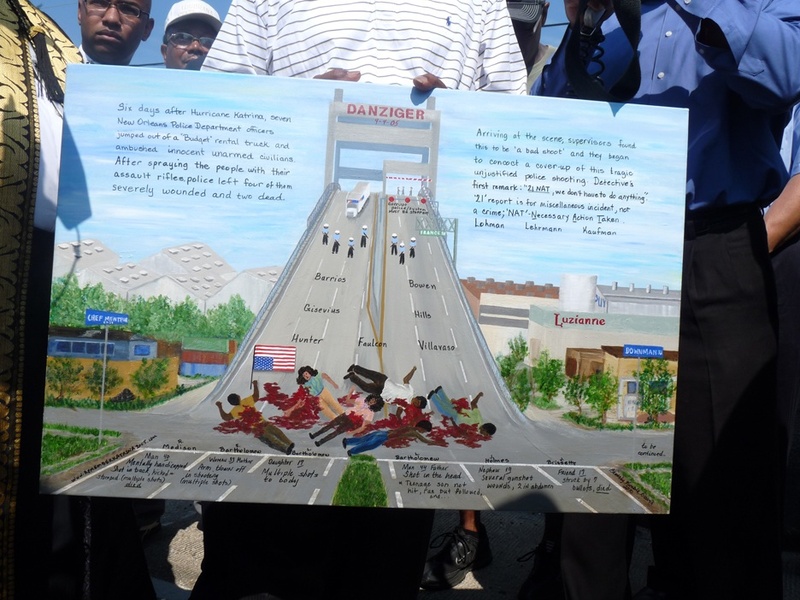 The Danziger Bridge case begins with Hurricane Katrina. As images of desperate survivors played on television, people around the world felt sympathy for people waiting for rescue after the storm. But then images of families trapped on rooftops were replaced by stories of armed gangs and criminals roaming the streets. News reports famously described white people as “finding” food while depicting Black people as “looting.” Then Chief of Police Eddie Compass told Oprah Winfrey that “little babies (are) getting raped” in the Superdome. Then Gov. Kathleen Blanco announced she had sent in troops with orders to shoot to kill; and the second in charge of the police department reportedly told officers to fire at will on looters. Evidence suggests that the NOPD acted on these instructions. On Sept. 2, just days after the storm, a Black man named Henry Glover was shot by a police sniper as he walked through a parking lot. When a Good Samaritan tried to help Glover get medical help, he was beaten by officers who burnt Glover’s body and left it behind a levee. The next day, a 45-year-old named Danny Brumfield Sr. was killed by officers in front of scores of witnesses outside the New Orleans convention center when he ran after a police car to demand that they stop and provide aid. 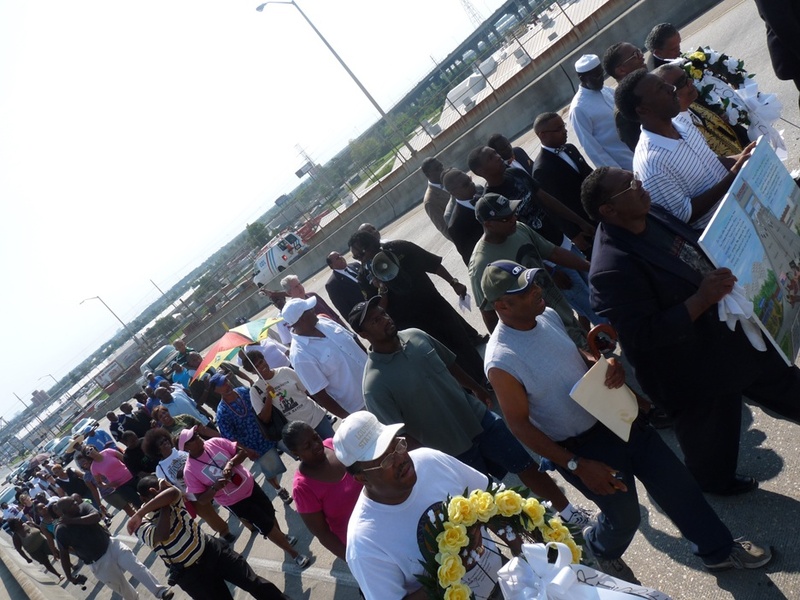 The following morning, two families were crossing New Orleans’ Danziger Bridge, which connects Gentilly and New Orleans East, two mostly middle-to-upper-class African American neighborhoods. Without warning, a Budget Rental truck carrying police officers arrived and cops jumped out. The officers did not identify themselves and began firing before their vehicle had even stopped. Officers had heard a radio call about shootings in the area; and according to prosecutors, they were seeking revenge. James Brisette, a 17-year-old called “studious” and “nerdy” by his friends, was shot nearly a dozen times and died at the scene. Many of the bullets hit him as he lay on the ground bleeding. Four other people were wounded, including Susan Bartholomew, a 38-year-old mother who had her arm shot off of her body, and her 17-year-old daughter Lesha, who was shot while crawling on top of her mother’s body trying to shield her from bullets. Lesha’s cousin Jose was shot point-blank in the stomach and nearly died. He needed a colostomy bag for years afterwards. Further up the bridge, officers chased down Ronald Madison, a mentally challenged man, who was traveling with his brother Lance. 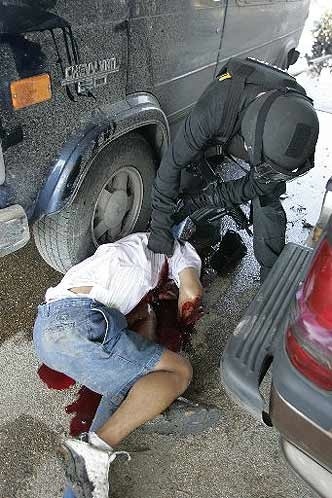 Ronald was shot in the back by one officer and then stomped and kicked to death by another. Lance was arrested and charged with firing at officers and spent weeks behind bars. A cursory investigation by the NOPD justified the shooting and it appeared that the matter was closed. In fact, for years every check and balance in the city’s criminal justice system failed to find any fault in this or other officer-involved shootings from the days after the storm. Eddie Jordan, the city’s first Black district attorney, pursued charges against the officers in late 2006. When the cops went to turn themselves in, they were greeted by a crowd of hundreds of officers who cheered for them and called them heroes. Before the case could make it to trial, it was dismissed by a judge with close ties to the defense lawyers and soon after that Jordan was forced to resign. But the Madisons, the Bartholomews and the Glovers, along with family members of other police violence victims, refused to be silent. They continued to speak out at press conferences, rallies and directly to reporters. They worked with organizations like Safe Streets Strong Communities, which was founded by criminal justice activists in the days after Katrina, and Community United for Change, which was formed in response to police abuses. Monique Harden, a community activist and co-director of Advocates for Environmental Human Rights, helped to bring testimony about these issues to the United Nations. Another post-Katrina organization, Peoples Hurricane Relief Fund, presented the charges to an international tribunal. 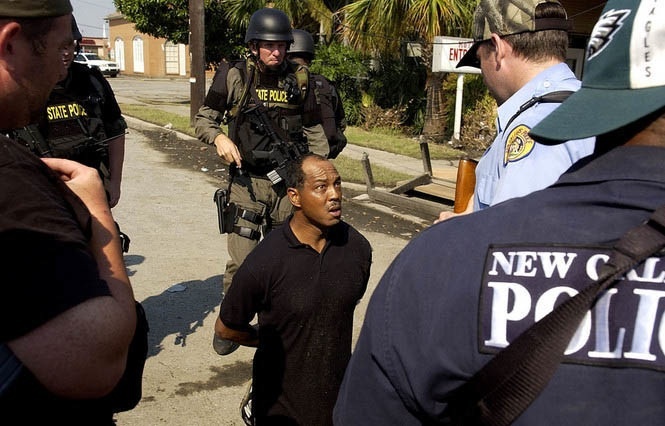 In 2008, journalist A.C. Thompson did what New Orleans media had failed to do and seriously investigated the accusations of police violence. His reporting, published on ProPublica and in The Nation, spelled out the shocking details of Glover’s killing and pointed toward police coordination with white vigilantes in widespread violence. It brought national attention to the stories that had been ignored. Activists took advantage of the exposure and lobbied the Congressional Black Caucus and the Justice Department for an investigation. In early 2009, a newly empowered civil rights division of the Justice Department decided to look into the cases. Federal agents interviewed witnesses who had never been talked to, reconstructed crime scenes and even confiscated NOPD computers. They found evidence that the Danziger officers had radically rewritten their version of what happened on the bridge that day. 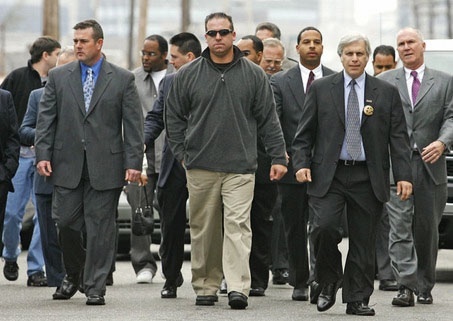 When FBI agents confronted officers involved in the Danziger case, five officers pleaded guilty and agreed to testify about the conspiracy to cover-up what happened. They revealed that officers had planted evidence, invented witnesses, arrested innocent people and held secret meetings where they worked to line up their stories. Before last week’s verdict, the Justice Department had already won four previous police violence convictions, including of the officers who shot Glover and burned his body as well as of two officers who killed Raymond Robair – a pre-Katrina case in which officers beat a man to death and claimed, with the support of the city coroner, he had sustained his injuries from falling down. About half a dozen other investigations are ongoing. The Justice Department is also looking at federal oversight of the NOPD, a process by which they can dictate vast changes from hiring and firing to training and policy writing. 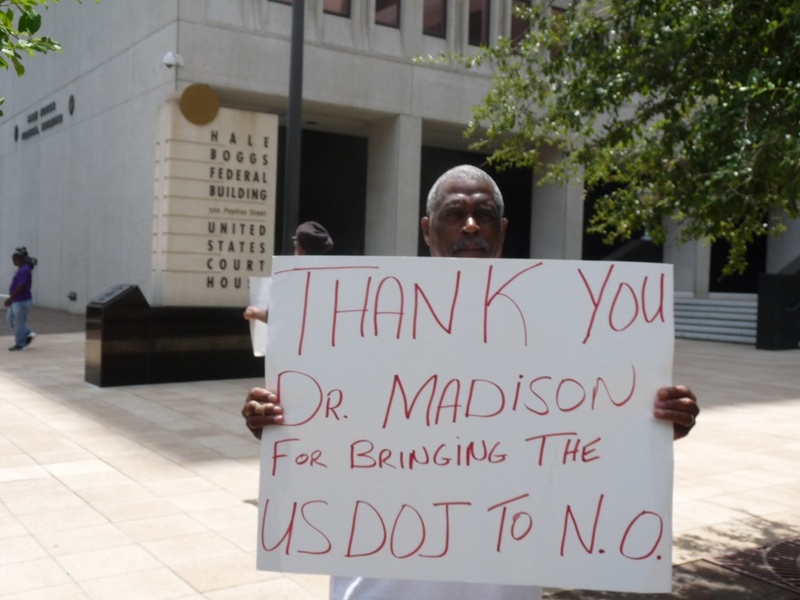 The Danziger trial has been the most high-profile aspect of the federal intervention in New Orleans and this verdict will have far-reaching implications for how the effectiveness of federal intervention is perceived. The convictions and guilty pleas in the case reveal a wide-ranging conspiracy that reaches up to sergeants and lieutenants. Marlon Defillo, the second-in-charge of the NOPD, was recently forced to retire because of his role in helping cover up the Glover killing. The defense team for the Danziger officers was steadfast in describing their clients as heroes. Attorney Paul Fleming described the cops as “proactive,” saying: “They go out and get things done. They go out and get the bad guys.” Police attorneys in the Glover and Danziger trials also sought to use the so-called “Katrina defense,” arguing that the exceptional circumstances following the storm justified extra-legal actions on the part of officers. With these convictions, the juries have definitively refuted this excuse. During closing statements, lawyers for defense and prosecution directed what often sounded like personal attacks against each other as well as key witnesses while laying out very different versions of what happened on that fateful day. In a spirited defense that seemed to echo Tea Party themes, police attorney Frank Desalvo told the jury, “We know that the United States is the greatest country on earth; and the only thing wrong with it is the people running it.” Depicting Justice Department attorneys as furthering an anti-cop agenda, he told the jury that the prosecutors in this case do not represent the United States and that they are the true Americans. Speaking outside the courthouse after the verdict, Sherrel Johnson, the mother of James Brisette, said that the officers “took the twinkle out of my eye, the song out of my voice and blew out my candle,” when they killed her son. Kenneth Bowen, Robert Gisevius, Anthony Villavaso and Faulcon, the officers involved in the shooting, could receive life sentences. Sgt. Arthur Kaufman, who was not on the bridge but was convicted of leading the conspiracy, could receive a maximum of 120 years. Sentencing is scheduled for December but will likely be delayed. Jordan Flaherty is a journalist and staffer with the Louisiana Justice Institute. His award-winning reporting from the Gulf Coast has been featured in a range of outlets including the New York Times, Al Jazeera and Argentina’s Clarin newspaper. He is the author of FLOODLINES: Community and Resistance from Katrina to the Jena Six. He can be reached at neworleans@leftturn.org and more information about Floodlines can be found at floodlines.org. For speaking engagements, see communityandresistance.wordpress.com. This story first appeared on ColorLines. Added to it are excerpts from the previous piece in this series; headlined “Deliberations Begin Today in Danziger Trial,” a version of that story first appeared on the New Orleans Tribune/TribuneTalk website. As a former Calif. Probation Officer I can attest that in far too many law enforcement agencies there's a code of "loyalty". If you narc out another officer you will probably pay for it. It may be a simple slashing of your car tires, or worse, someone not backing you up in a dangerous situation. Until this culture of protecting the guilty, just as it was in the Catholic Church is dismantled we will continue to see these situations arise. 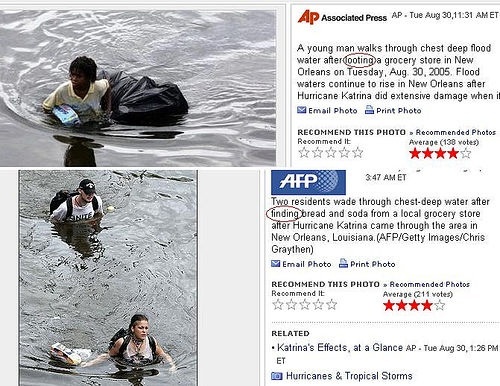 Also I wish the media would still concentrate more on correcting the mistakes it made in its reporting after Katrina. While we believed the rumors inside, the murders and rapes in the Superdome were not supported by evidence. We all were controlled by fear and rumor, but this in no way excuses the police behavior. Dr. Firpo Carr's portion of the program will air at about 7:30 am. He will be interviewed by Mr. Harold (Hal) Clark. The listening audience will be made aware of the reasons why the unjust charges against Sgt. Gerard Dugué should be dropped. Additionally, please click “Dugué Defense” link at the http://www.firpocarr.com website. Articles on Dugué’s innocence have already appeared online—in 34 languages. There is a keen worldwide interest in his case. Following is a link to the 8/14/2011 Sunday Journal WYLD discussion in which Dr. Firpo Carr is interviewed by Mr. Hal Clark regarding Sgt. Gerard Dugué's innocence regarding the Danziger Bridge murders and why the case against Sgt. Dugué must be dismissed. Following is a link to this week's "Dugué Defense Part 6." Dr. Firpo Carr develops the theme, "Innocence Held in Abeyance." Dr. Carr continues to expose the Justice Department's sham case against Sgt. Gerard Dugué. It is quite evident that they recognize the public is aware of Sgt. Dugué's innocence regarding the bogus charges which must be dismissed.